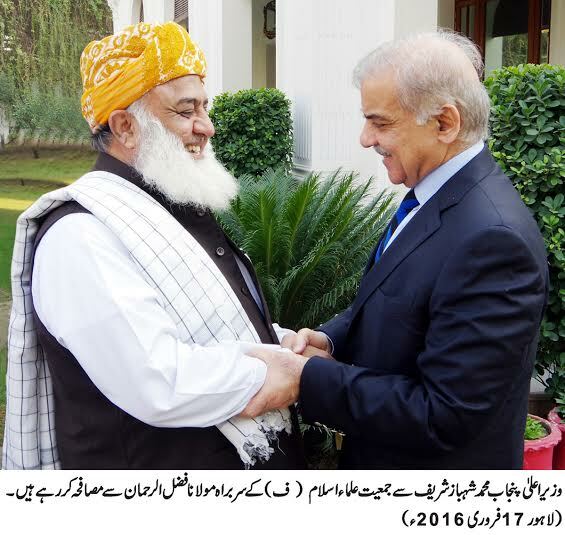 Lahore: Leader of Jamiat Ulema-e-Islam (F) Maulana Fazal ur Rehman met Punjab Chief Minister Muhammad Shehbaz Sharif here today. Matters of mutual interest, political affairs and overall situation of the country was discussed in the meeting. Speaking on the occasion, the Chief Minister said that under the leadership of Prime Minister Muhammad Nawaz Sharif, decisions have been taken on important national issues by taking political parties in confidence. He said that government is striving for achievement of the mission of progress and prosperity of the masses. He further stated that there is a need for tolerance, restraint and brotherhood in the society and concerted efforts should be made for national progress and development. He said that the problems being faced by the country will have to be resolved through collective wisdom and efforts. The Chief Minister said that the menace of terrorism and extremism will be rooted out through mutual unity. Federal Minister Akram Durrani was also present on the occasion.